It’s hard to believe the first international break’s already here, but it’s been a satisfying first ‘block’ of the season for Wigan Athletic and boss Paul Cook. A return of 10 points from the opening six games is one I think we all would have taken. And at the risk of being greedy, it could have been even better, with stoppage-time goals being conceded against Aston Villa and Nottingham Forest. But the fact two of the biggest sides in the Championship required last-gasp goals to deny Latics a deserved draw and a warranted win respectively, underlines how well Cook’s men have started. Unlike two years ago, under Gary Caldwell, Latics have made the most of the momentum generated from winning the League One title and hit the ground running in the second tier. With a much smaller turnover of staff, more of the players who got Latics up have been given the chance to prove they belong at this level – and that’s proved to be a successful formula so far. Cook will take the opportunity of giving a few of his big hitters a few days off before the return to duty on Saturday week at Brentford, as well as getting some work into the legs of those who maybe haven’t had as much action as they would have hoped. It’s a balancing act, but one Cook has got dead right so far. You only have to look at the weekend win over Rotherham for proof of that. Not too many Latics fans would have made the bold decision to withdraw Will Grigg and Nick Powell on the hour mark at 0-0. I know I wouldn’t have, for one! But substitutes Callum McManaman and James Vaughan immediately took the opportunity to showcase their talents, giving Cook a selection headache he will welcome moving forwards. The gaffer could also have Dan Burn and Darron Gibson back for the Brentford game, with Gavin Massey and Michael Jacobs also on the way back from injury. It won’t be easy to keep everyone happy, and difficult decisions will have to be made. But Cook’s not got a lot wrong so far, and it’s a far better situation to be in than two years ago, when the problem was nowhere near enough quality to go around. The loan system certainly has its critics. It’s hard, for example, to justify a situation whereby Chelsea have a jaw-dropping FORTY players currently away with other clubs. 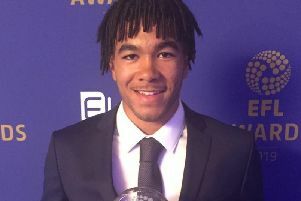 But one of those – Reece James – could well be the exception that proves the rule. Incredibly, prior to arriving at the DW this summer, the 18-year-old right-back had yet to make his professional debut. But his remarkable consistency has meant Nathan Byrne – last season’s player of the year – is unable to get back in after injury. On the other side of the defence, 21-year-old Antonee Robinson has been making similar strides, which will not have gone unnoticed at his parent club, Everton. Both look set to be Premier League stars for years to come – and Latics fans should enjoy watching every step of their progress and bask in the reflected glory. It’s great to see Will Grigg back on the international stage with Northern Ireland. I don’t know what’s been going on over the last couple of years to limit his involvement to just 50 minutes of game-time since gatecrashing the squad for Euro 2016. But now’s the time to put all that frustration behind him and prove what Wiganers have known all this time. When is a three-match ban not a three-match ban? That’s what former Latics midfielder Max Power – now with Sunderland –will be mulling over this week as he counts the cost of a moment of madness at the weekend. Having seen the incident, it’s hard to argue with the red card awarded for chopping down Oxford’s Marcus Browne – who spent time on loan with Latics two years ago. That brought with it an automatic three-match suspension. Fair enough, right? Well Sunderland’s next match happened to be in the Checkatrade Trophy on Tuesday against Stoke Under-21s. For reasons best known to the FA, these are not recognised as ‘proper’ matches. So Power was not allowed to use the game as part of his suspension. However, as he’s on the ‘banned’ list, he was also unable to play in the game! It’s the same situation Chey Dunkley found himself in last term, after his sending-off for Latics against Portsmouth. Four games for the price of three. And one very large loophole the FA have to correct. Among all the deals announced by Latics over the last few weeks, the signing of Academy striker Joe Gelhardt to his first pro contract slipped under the radar somewhat. But it could well prove to be one of the most significant in the club’s recent history. To say the 18-year-old England starlet was highly-rated is something of an under-statement. In fact, it would be easier to name the top Premier League clubs who WEREN’T keeping tabs on his progress. But what a pat on the back for all everyone involved with the Latics Academy – under the watchful eye of Gregor Rioch – that he and his family felt his career would be better served by staying at Wigan.